Over 90 scientists worldwide contributed their research to this comprehensive volume on the biology, epidemiology and control of Verticillium. 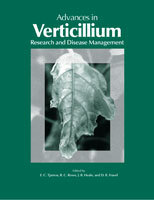 Advances in Verticillium: Research and Disease Management includes research on molecular biology and vegetative compatibility of Verticillium species and strains; the epidemiology, physiology, and host-parasite interactions of Verticillium species; and the management of Verticillium wilt diseases using biological, cultural, and chemical means. Future research priorities are also discussed in the areas of taxonomic relations of species and strains, soil microbiology, and new disease management approaches. Part 1: Molecular Biology of Verticillium spp. Harrington, M. A., and Dobinson, K. F.
Koike, M., Nagao, H., Dobinson, K., and Robb, J.
Karapapa, V. K., Bainbridge, B. W., and Heale, J. B.
Pérez-Artés, E., García-Pedrajas, M., Bejarano-Alcázar, J., Korolev, N., Rodríguez-Juarado, D., Katan, T., Katan, J., and Jiménez-Díaz, R. M.
Aspromougos, I., and Schlösser, E.
Paplomatas, E. J., and Lampropoulos, C. J.
Pramateftaki, P., and Typas, M. A.
Platt, H. W., Maclean, V., Mahuku, G., and Maxwell, P.
Kouvelis, V., and Typas, M.
Korolev, N., Katan, J., and Katan, T.
Rataj-guranowska, M., and Hiemstra, J. A.
Rowe, R. C., Johnson, D. A., and Omer, M. A.
Hiemstra, J. A., and Rataj-Guranowska, M.
Korolev, N., Jiménez-Díaz, R. M., Katan, J., Pérez-Artés, E., García-Pedrajas, M., Bejarano-Alcázar, J., Rodríguez-Juarado, D., and Katan, T.
Gennari, S., D’Ercole, N., and Mirotti, A.
Ebihara, Y., Nagao, H., Koike, M., and Shiraishi, T.
Strunnikova, O. K., Vishnevskaya, N. A., and Muromtsev, G. S.
Lamers, J. G., and Termorshuizen, A.
Goud, J., Termorshuizen, A., and Gams, W.
Platt, H. W., Mahuku, G. S., Maxwell, P., and Maclean, V.
Tomescu, A., Voican, V., and Racaru, V.
Vloutoglou, I., Paplomatas, E. J., and Lampropoulos, C. J.
Cooper, R. M., Resende, M. L. V., Flood, J., and Mepsted, R.
Cirulli, M., Ameduni, M., and Colella, C.
Nachmias, A., Holtzer, O., Livescu, L., Tsror, L., Van Der Zaag, D., and Krikun, J.
Arbogast, M., Powelson, M. L., Cappaert, M. R., and Watrud, L. S.
McFadden, H., De Feyter, R., Murray, F., Grover, A., Llewellyn, D., Dennis, E., and Peacock, W. J.
Ligoxigakis, E. K., and Vakalounakis, D. J.
Karapapa, V. K., Baig, M. A., Heale, J. B., and Rossitier, J. T.
Saparno, A., Heinz, R., and Robb, J.
Danti, S., and Broggio, M.
Govorova, G. F., and Govorov, D. N.
Katsantonis, D., Hillocks, R., and Gowe, S.
Zeise, K., and Kersten, H.
Solarska, E., Fravel, D. R., and Pietr, S.
Berg, G., and Lottmann, J.
Tjamos, E. C., Tsitsiyiannis, D. I., Tjamos, S. E., and Panagopoulos, C. G.
Tjamos, S. E., Venieraki, A., Tsitsiyiannis, D., Tjamos, E. C., and Katinakis, P.
Paplomatas, E., Tzalavaras, S., and Devay, J. E.
D’Ercole, N., Nipoti, P., Di Pillow, L., and Gavina, F.
Lottmann, J., Heuer, H., Smalla, K., and Berg, G.
Berg, G., Frankowski, J., and Bahl, H.
Lazarovits, G., Conn, K., and Tenuta, M.
Davis, J. R., Huisman, O. C., Westermann, D. T., Everson, D. O., Sorensen, L. H., and Schneider, A. T.
Crowe, F., J., Debons, J., and Farris, N.
Fravel, D. R., and Larkin, R. P.
Parks, R. L., Powelson, M. L., Cappaert, M. R., and Johnson, K. B.
Davis, J. R., Huisman, O. C., Sorensen, L. H., and Schneider, A. T.
Nachmias, A., Holtzer, O., Livescu, L., Tsror, L., and Krikun, J.
Koike, S. T., Xiao, C.-L., Hubbard, J. C., Schulbach, K. F., and Subbarao, K. V.
Tsror, L., Erlich, O., Amitai, S., and Hazanovsky, M.
Gordon, T. R., Larson, K. D., Duniway, J. M., Paulus, A. O., Vilchez, M., and Westerlund, F.
Termorshuizen, S. J., Blok, W. J., and lmers, J.G. López-Escudero, F. J., and Blanco-López, M. A.
Bletsos, F. A., Thanassoulopoulos, C. C., and Roupakias, D. G.
Bejarano-Alcázar, J., and Jiménez-Díaz, R. M.
Lock, T., and Buck, S.
Davis, J. R., Everson, D. O., Sorensen, L. H., and Schneider, A. T.
Denner, F. D. N., and Millard, C. P.
Ma, P., and Shezeng, L.
"This book will definitely become a significant reference source for all scientists and students interested particularly in the plant pathogenic species within Verticillium."